SELINSGROVE, Pa. – Mark Smith of Sunbury secured the lead in Saturday night’s 25-lap 360 sprint car feature at Selinsgrove Speedway on the fourth circuit and drove to his third win of the season at the track. The $2,000 victory was Smith’s 25th career in 358-360 sprint car racing at the Snyder County oval at the wheel of the Mach 1 Chassis No. 1. Johnny Scarborough made it two-for-two in the 305 sprint car division at Selinsgrove this season when the Bomoseen, Vermont, driver bested a strong 32-car field. Kyle Bachman of Selinsgrove scored his fourth win of the season and 49th career in the 15-lap pro stock main event, while Kevin Imes of McCalisterville won $1,000 in the 15-lap roadrunner invitational. 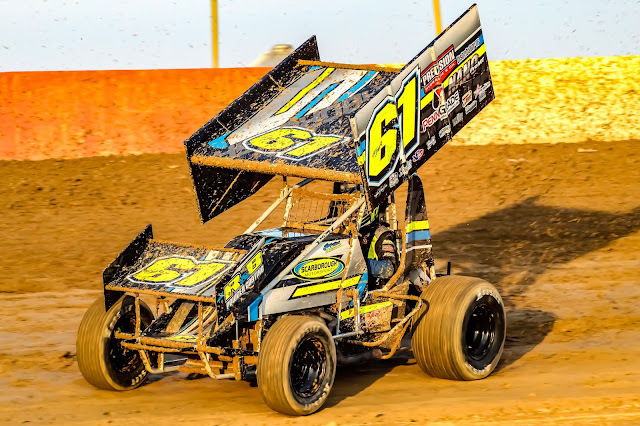 Jake Waters of Mifflintown, who was seriously injured in racing accident at the track on July 3, 2016, made an emotional behind-the-wheel return to Selinsgrove in the 305 sprint car division and drove to a solid fifth-place finish. 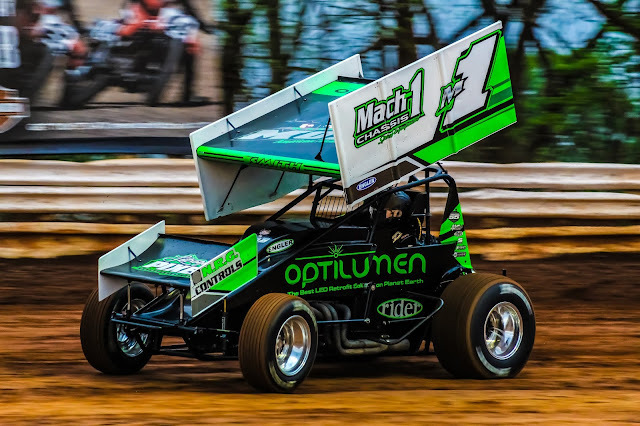 Selinsgrove Speedway is back in action at 7:30 p.m. Saturday, Aug. 4, with the 18th annual Mach 1 Chassis National Open for 360 sprint cars paying $5,000 to win and $300 to start out of the $17,000-plus purse. The super late models and pro stocks will also be on the racing card. The rain date, if needed, will be Sunday, Aug. 5, at 7 p.m.
Front row starters Colby Womer and Eddie Strada drag raced into the first turn for the early lead in the 360 sprint car main event. Womer emerged out of turn two with the race lead. Sxith-place starter Mark Smith quickly worked his way into the runner-up position. Womer led through lap three, when Smith made the winning pass using the inside lane out of turn four. On the eighth lap, third-place starter Michael Walter showed some speed and drove into the runner up position. The race’s first caution flag unfurled on lap 11 when Ryan Linder’s car rolled to a stop in turn turn. On the ensuing restart, Smith set the pace with eighth-place starter Jason Shultz on the move. Shultz got by Womer for second on lap 15 and set his sights on Smith. The field was regrouped on lap 23 when Mike Koehler brought out the caution flag with a flat tire on his machine. Smith led the rest of the way and posted a 1.3-second margin of victory over Shultz. Derek Locke, Walter, and Davie Franek rounded out the top five. In the 305 sprint car feature, polesitter Johnny Scarborough edged out front row starter Jake Waters for the lead. Waters chased Scarborough through lap nine when on a restart seventh-place starter Zach Newlin stormed around both Austin Bishop and Waters for the runner up position. At the halfway point, Newlin was gaining on the leader and in slower traffic moved into striking distance. Newlin made a last ditch effort to snag the lead and win but came up a mere .28 of a second short at the finish line. Ken Duke, Bishop, and Waters rounded out the top five. A multi-car tangle opened the pro stock race with most of the cars rejoining for the restart. Front row starter AJ Stroup pulled into the early lead until fifth-place starter Brandon Moser took command of the field. Sixth-place starter Kyle Bachman reeled in Moser and dueled for the lead for several laps until Bachman gained control on lap six. Bachman stretched his lead in the final laps and posted a 1.3-second margin of victory over Moser. Tommy Slanker, Cory Long, and Shaun Lawton rounded out the top five. Polesitter Dustin Hoffman powered into the early lead in the roadrunner race. On a lap two restart, fifth-place starter Ryan Leister made a pass for the front spot with Hoffman and Will Brunson racing for second. On the fifth circuit, Brunson and Hoffman made contact in turn four, with both of their cars receiving damage. Ryan Zook also withdrew from the race. On the lap six restart, Kevin Imes took over the lead with Bob Bussey and Keith Bissinger in pursuit. In a one-lap chase to the checkered, Imes held off Bussey by just .04 of a second for the win. Bissinger, Jake Jones, and Terry Kramer rounded out the top five.